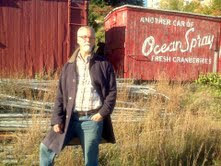 Followers, here are pics from the photo shoot, a beautiful fall day on Portland Maine's Eastern Promenade. Thanks to huzbears Brian and Martin for being my photographers. The sewing machine is going to be put away temporarily while I work on insulating the attic here at "this old house". 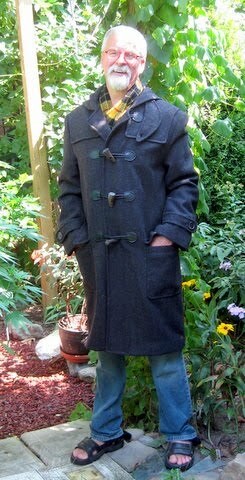 When I return I may work on a short trench jacket in olive green stretch denim. In the meantime enjoy your sewing adventures. I really worked at a fever pitch to wrap this project up. 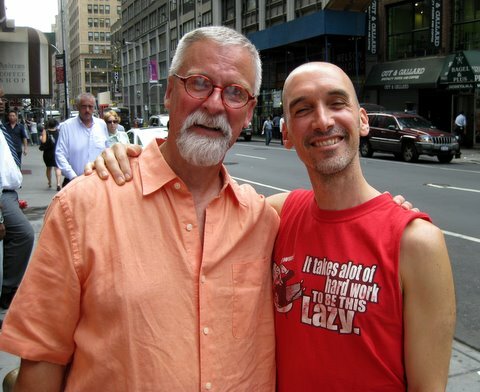 My goal was to wear it to the Met Opera simulcast of Das Rheingold on Oct. 9th. Huzbear Brian was planning on wearing his black opera cape, and although I couldn't compete with THAT, something long and purple would be better than the LL Bean barn coat that's pretty much de rigueur in this neck of the woods. The diagrams for completion of this coat were completely baffling, most notably how the lining was secured to the back vent and how the collar was finished off. Even my gal Edna Bishop was of little use. In the end I just winged it. I hand stitched the inner and outer collar stands together at the nape of the neck. The diagram showed some kind of topstitching somewhere, but that just seemed like a recipe for disaster. I'd much rather spend the time putting in some invisible stitches by hand than to add some topstitching that screams "homemade". The sleeves and bottom hem were reinforced with hair canvas / muslin just as I did on the duffle coat. I saved the back vent till last by attaching the lining to the hem at both fronts and working my way around to the back. 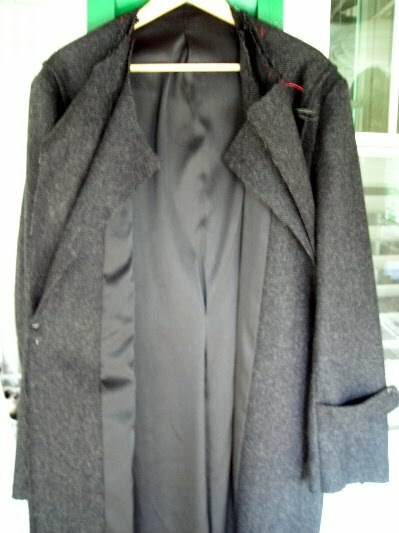 With the coat on a hanger I trimmed the lining and improvised until I could make it look like the diagrams. Maybe some day I'll learn the correct technique (some instructions in English couldn't hurt!). I really get a surge of excitement when all the bits and pieces come together and I actually have something that can go on a hanger. 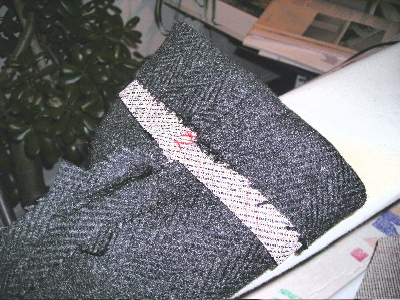 The interfaced under collar is attached. The plaid outer collar assembly is complete and will be attached to the lining. I will actually end up making the coat twice and then sewing the two together. On to the lining. I forget which. 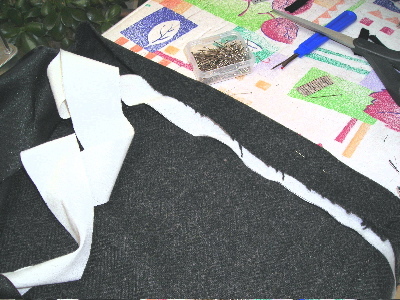 I've completed the inside chest pocket. Once again I deferred to Edna Bishop who provided very clear instructions on how to finesse this tricky bit with just 3 pieces. My Japanese version featured 4 pieces that in no way resembled what I ended up using. 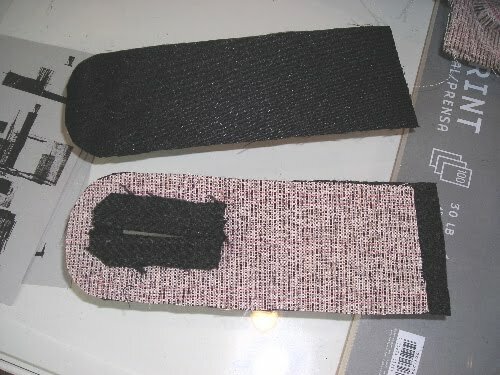 The area was first reinforced with a strip of lightweight fusible interfacing. Then the whole contraption was pinned and hand basted into place. The fabric eventually ends up getting slashed which I find completely terrifying. Amazingly, once everything is twisted and flipped through the hole...Voila you have a pocket. I won't confess how long all this took. I'm just glad that all the pockets are finished. No pic for this post. The coat is finally finished and I'm waiting for huzbear Brian to come back from vacation to take some pictures of me modeling it. So while I wait, I thought it would be interesting to pull out my receipts and see how much the project has cost. Adding a generous $20 for thread and considering that I have enough hair canvas and flannel lining for another coat, the total is $165. 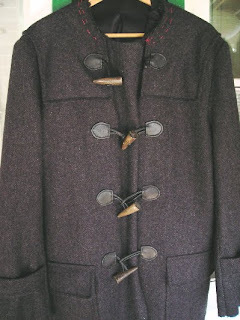 Just for the heck of it I suggest you check out the Ralph Lauren flannel toggle coat currently available at Bergdorf Goodman's website. It will ship to you in October for a mere $1895. The picture is quite murky but it appears to have ( Gasp!) wooden toggles. Can we say cheap? And does the model have a huge wad of chewing tobacco in his cheek? You decide. 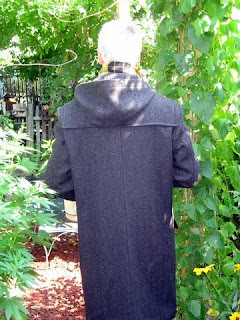 I'm feeling slightly adrift now that this project is over, so I'm planning to start a fall coat. I know I previously said I'd start a trench coat, but I'd much rather have something that I can wear in the upcoming season. 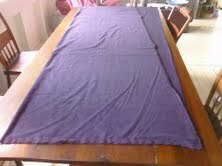 My next project will be a deep eggplant brushed cotton twill balmacaan. Totally yummy. 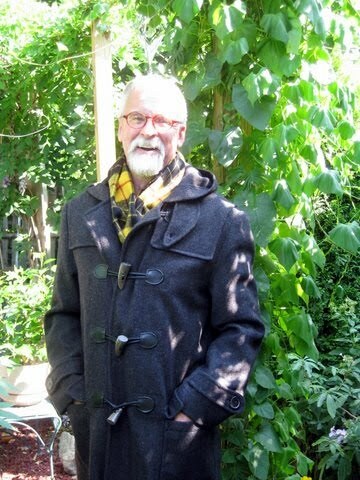 I'm just "saying NO" to all the topstitching on my coat. If I'd made the unlined version it would be necessary to hold things in place, but I think it looks more professional without it. Plus nothing looks worse than a garment with bad topstitching, and I don't want to run that risk. To hem the sleeves I inserted a 2" wide bias strip of my hair canvas. 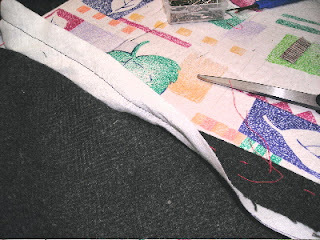 The hem is folded up over the strip and the two are sewn together. The actual hemming is between the hair canvas and the coat fabric. The same technique is used on the bottom hem except the bias strip is muslin which I hit with some spray starch. 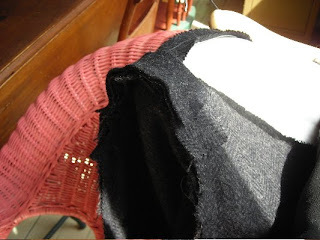 In one of the pictures you can see how the hem and strip are sewn together. I wonder if the $2000 Burberry version has this kind of attention to detail? You'll also see that I hand basted the strip into place. I've become a HUGE believer in hand basting while working on this project. This should make my daughter, the monster making / hand sewing queen, proud of the old man. Hard to believe, but all that remains is sewing the bottom hem of the lining into place. Hell NO, I haven't been slacking! I need to get caught up with all the progress that I've made. 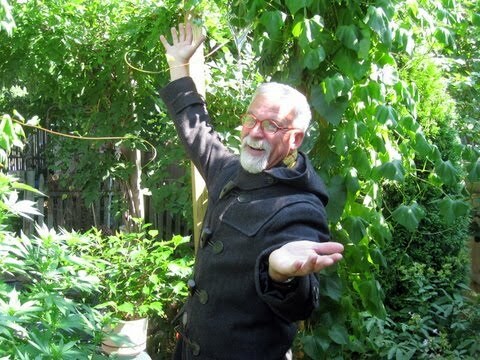 I actually have a coat that I can put on, not that I exactly want to wear a wool coat in the middle of summer. The major pieces went together easily and I used my Bishop Method book which emphasizes sewing in the proper direction. 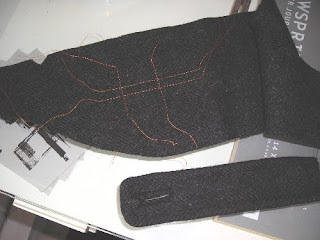 Shoulder seams are sewn outward, vertical seams are sewn bottom to top. I don't ask why, I just do what Edna says. After setting in the sleeves I beefed up the shoulders by hand sewing a 6" and 4" bias strip of wool over the sleeve cap. This really helped smooth out the sleeve cap. 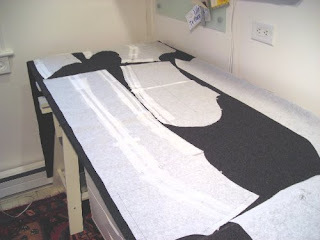 The coat, as designed, is unlined so I had to develop patterns for a lining. I used the sleeve patterns as is. 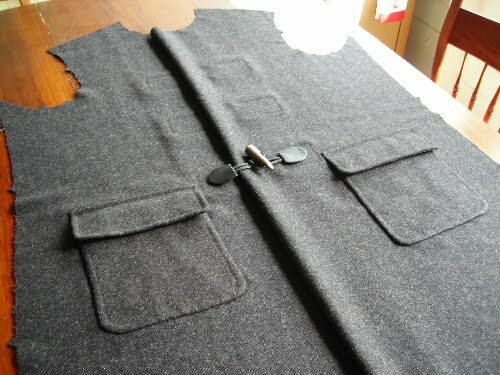 The back was cut on the fold allowing for a 1" center back pleat. The front lining required some calculating, but again the Bishop Method book was a big help. Because I want the lining to be free moving I needed to attach the leather toggles and tabs before attaching the lining to the coat. Each leather tab took well over 1/2 hour to sew on. 4+ hours of hand sewing later I'm just about ready to put the whole thing together. I just want to tweek some of the seam binding in the hood, and rip out and re-do a front seam where the lining and front facing connect. I sense being in the home stretch of this project. I've found a trench coat sew-along blog, and even though I'd be way behind everyone, I may jump in with my bargain olive green stretch denim. Thanks to everyone on the Pattern Review message boards who advised me on the patch pockets. It was unanimous that I interface the entire pocket even though the instructions (just pictures) don't show it. I think they would have been very disappointing if I had merely lined them. I'm getting a lot of mileage out of my hair canvas. In addition to the pockets I also interfaced the reinforcement patches that the toggles will be stitched to. I spent quite a bit of time positioning the patches because they really need to line up. 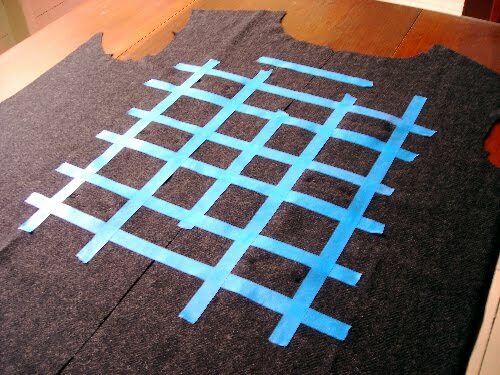 I lined everything up with masking tape and then topstitched the patches in place using the tape as a guide. Voila! I've also attached the pockets and their flaps. 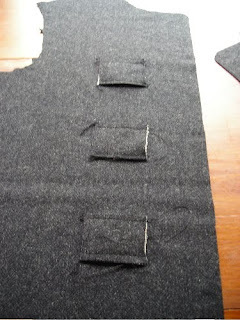 Marji from the Great Coat Sew-along blog has a great tutorial on patch pockets. 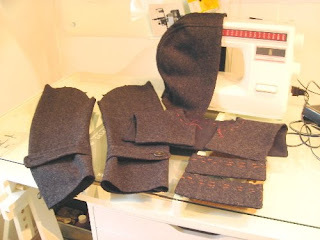 She topstitches the pocket first and then sews it by hand onto the coat. It's time consuming, yes, but it looks SO much better and eliminates that look of the pockets just being tacked onto the coat. 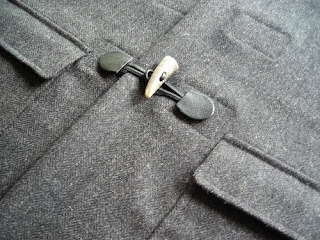 The coat fronts are now complete and I've laid them out with a toggle to get a sense of what it will look like. Things should start moving ahead quickly from this point. I was really hoping today would rain so I could make some headway on this project. I managed to get several of the design details finished. I made the pocket flaps which are lined with black satin and interfaced with the hair canvas. Then I moved on to the yoke which is lined with black flannel. 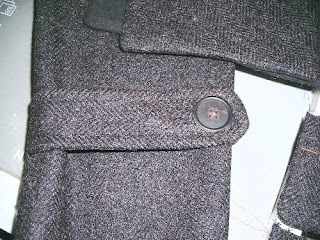 It will be topstitched directly onto the coat once the fronts and back are connected. The real challenge of the day was to make the tabs at the sleeve cuffs. Because my sewing machine makes cheesy looking buttonholes I decided to make bound buttonholes per Edna Bishop. I'm not going to bore you with all the details, I'm sure there are plenty of instructions on the internet. If anything, I hope I can encourage you to try them. Hey, if I can do it..... While I was working on them I realized that details like this are why I'm taking on this project in the first place. It's all about having something unique, with an attention to detail that I would never be able to afford. The next step will be to construct the pockets, but I have a question out to the Pattern Review message board that I'd like to have answered before I launch out on my own. I really don't want to screw them up. Ok. This pattern, as published, is for an unlined coat. All the seams call for bias tape to cover the raw edges. 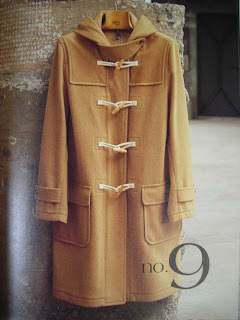 I really can't imagine wearing an unlined wool coat, so I guess it must be something Japanese. Anyway, I plan on lining the coat with the exception of the hood. I don't think I've ever seen anyone wearing this style of coat who would be caught dead with the hood up. Maybe in a blizzard when you're trying to dig the car out of a ditch. 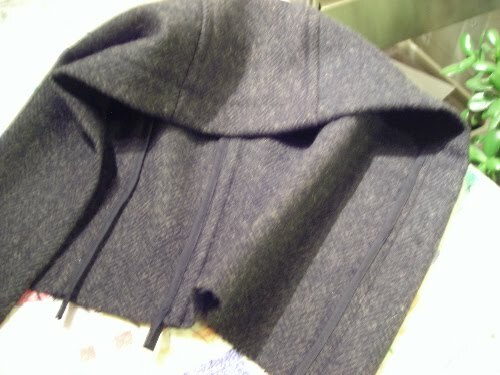 I see the hood as more of a built in scarf / big floppy collar. I have decided to leave it unlined. Thankfully this will be the ONLY unlined part of the coat. I have never worked with bias tape before and found it moderately difficult to sew well. Because my fabric is fairly thick it just barely covered the raw edges. I did try a wider width, but it made the seams too stiff and inflexible. 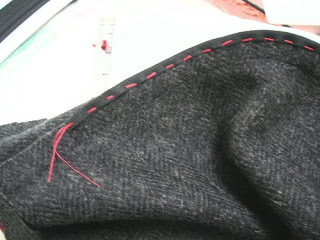 I ended up hand basting the seam binding to the edges and then stitching with the machine. The seam allowances were then pressed to one side and topstitched down. Time consuming, but in the end worth it. I'm just very glad I don't have to do every seam of the entire coat. I was up early this morning. 3 cups of coffee later I was ready to cut out my coat. I decided to review Edna Bishop one last time. I wonder how many sewists she's scared / discouraged over the years with her constant harping on PERFECTION. I have to admit I was just about paralyzed into inaction, constantly questioning if I had achieved true Grain Perfection. I put all my self doubts aside, took a deep breath, pinned on my pattern pieces according to the diagrams and cut the coat out. Hooray! Today I'm going to shop for thread and some new bobbins. I also need to preshrink the lining and cotton flannel that I'm using. Just in case you've forgotten, here's what I'm trying to make. The only remaining pattern piece to make has been the yoke, and it's turned out to be a 2 day mind bending experience. It didn't affect the muslin version so I could ignore it, but it's a major design element of the coat which I needed to resolve. It's one piece, cut on the fold, which will drape over the shoulders both front and back. It's a crazy shaped piece which takes up a big chunk of my fabric "real estate", so I can't afford to screw it up. Of course it doesn't help that I've changed the shoulder line and slashed and taped the front and back pattern pieces multiple times. The whole yoke pattern needed to be redrawn to fit. I had a stiff mojito before attempting to work on it last night which was a huge mistake. I kept shuffling between the original pattern and my enlarged pattern, laying one over the other until I was completely befuddled and decided I should just go to bed. I decided to tackle it again today sans alcohol, but I've still spent a huge amount of time trying to figure it out. Hopefully it's right because I will be cutting it out tomorrow morning.